You walk the halls of the Los Angeles Dodgers’ baseball operations department at your own risk, never quite knowing what’s around the corner. You may stumble into a vicious whiffle ball game, with Dodgers president Andrew Friedman smashing the ball off the light fixtures, or firing a fastball into your rib cage. Keep an eye out for a stray rubber ball coming toward you, too, the one Friedman fires at any unsuspecting visitor, checking your reflexes. Duck into their offices, and if there was ever an Olympic gold given for waste basket, bank shots, Friedman is the Michael Phelps of Nerf basketball. Come by after work, and you may get recruited to play in a pickleball or spike ball game, just as the Dodgers’ brass did until nearly 2 a.m. the night of the trade deadline, with senior vice president Josh Byrnes and assistant farm director Jeremy Zoll the last ones standing. You want to know the secret behind the Dodgers’ success, reaching 83 victories faster than any National League team since 1944, there’s no need to look any further than their front office. Its brand is Analytic Geek Squad, a group boasting Wall Street resumes, MIT diplomas and Ph.Ds. Yet, while they routinely pore over statistical data with their players, they’re actually accepted and embraced within the clubhouse culture as one of their own – averting the chasm so often seen between players, field staff and front-office executives. Make no mistake, this is an organization that thrives on data. Players are given charts before each game on everything from defensive positioning to opposing pitchers’ tendencies to secretive injuries. Catcher Yasmani Grandal has a color-coded cheat sheet on his wrist band. Outfielders carry index cards in their back pockets during games, reminding them of their defensive placement. Players are given access to a proprietary statistical website. Manager Dave Roberts is provided so much information before every game that he could launch a NASA program. And, please, the notion that the front office is making out the lineup card, Roberts says, is a narrative that needs to go away. “That has never, ever happened,’’ Roberts says. “There’s always been that collaboration, bouncing thoughts off one another. We use all of the data from lineup construction to positioning to pitcher’s usage and matchups, but as far as the lineup cards, that’s my call. It’s really no different, the Dodgers will tell you, than the internal front office collaboration, despite its “League of Rivals” makeup: Six former GMs from six different organizations. Let’s see, you have Friedman from Tampa Bay, GM Zaidi from Oakland, Byrnes from San Diego and Arizona, Alex Anthopoulos from Toronto, Gerry Hunsicker from Houston and Ned Colletti, who’s technically now in the broadcast booth after being the Dodgers’ GM. When it’s time to make those ultimate decisions that can make or break an organization, Friedman has gathered everyone together, debated the intricacies of every potential moves, and acted boldly, with conviction. “I think at first when I saw all of the experienced guys they hired,’’ says Hunsicker, Dodgers senior adviser, “it was a bit of a head scratcher. That went away quickly. I think it gets down to Andrew’s ability to not only evaluate talent on the field, but talent in the front office. They now are the architects of a team that’s on the greatest tear in 105 years. The Dodgers have gone 48-9 since June 7, even with three-time Cy Young winner Clayton Kershaw on the DL, and are now on pace to win 115 games. Their .709 winning percentage would be the greatest in the franchise’s 134-year history. This is a staff that has built an organization so deep and talented that it not only has the best 25-man roster in baseball, but one of the top top five farm systems, too. In the last year alone, they refused to include prized prospect Cody Bellinger in trade talks for Chicago White Sox ace Chris Sale, and have now watched him emerge as an MVP candidate with 34 home runs. They traded former first round pick Zach Lee last summer to the Seattle Mariners for struggling infielder Chris Taylor, only to watch him hit .310 with 17 homers and a .933 OPS this year. They snubbed the entire free-agent market last winter, wanting to reduce their payroll for the second consecutive year, but made sure to bring back their own, spending $192 million in retaining closer Kenley Jansen, third baseman Justin Turner, and Hill. And now, in the third season together since Friedman, Zaidi and Byrnes joined the organization, they have constructed perhaps the greatest Dodgers’ team ever assembled, favored to win their first World Series since Ronald Reagan was president. 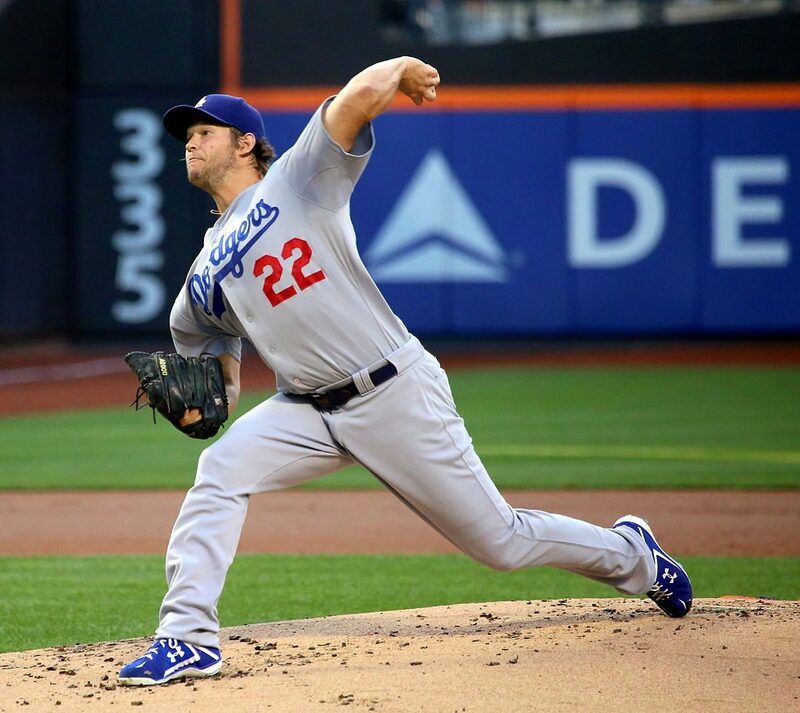 “It’s World Series or Bust!’’ Dodgers utilityman Kiki Hernandez proudly tells USA TODAY Sports. “We are the best team by far on paper, so it’s not about making the World Series. It’s about winning the World Series. I don’t think just making it to the World Series is any different than making it to the NLCS, if you don’t win it. “We don’t want a ring that say NL champions. We want that big ring that says World Series champions. That’s all that matters. The only player on the Dodgers who has a World Series ring is veteran second baseman Chase Utley, but please, don’t bring it up to Friedman. You see, it was Friedman’s former team, as GM of the Tampa Bay Rays, that lost to Utley and the Philadelphia Phillies in 2008. To this day, it still haunts Friedman, who wonders what would have happened without those two days of rain that put the skids on a Rays Game 5 rally. Friedman never did bother wearing that AL championship ring, handing it over to his father. He’s waiting for the real thing. Who knows, a World Series perhaps could even lead him to the man he always wanted to meet: Larry David. “That’s my goal, to meet Larry David,’’ says Friedman, a diehard Curb Your Enthusiasm fan. “I really want to meet him. I feel like I’ll be incredibly self-conscious when I’m talking to him, he’s made a career out of those interactions. In the meantime, with NBA Hall of Famer Magic Johnson creating a buzz when he stopped into the Dodgers’ offices last week during the trade deadline, and Hollywood celebrities sitting behind the plate each night, the Dodgers have suffocated the suspense out of the regular season. They lead the NL West by 18 games, the biggest lead at any time in a season in franchise history. They are bludgeoning everyone in their wake, outscoring the opposition by 208 runs. These victories are becoming so routine that the peanut vendors are showing more emotion after their victories than the actual players. The Dodgers briefly crank their clubhouse stereo after games, with a disco ball twirling on the ceilings, but by the time the clubhouse opens to the reporters, you would have thought the Dodgers just walked in from mowing the yard. They refuse to get giddy about their 115-victory pace, or even accept praise for their accomplishments, insisting it’s too early for victory laps. They may have a legitimate shot to win more regular-season games than any team in baseball history, but to a man, no one is even concerned with the possibility of immortality. Why, when Roberts was asked if he could even remember the last time the Dodgers lost a series, he knew it was against the Washington Nationals, but had no idea it was back on June 6-8, 19 series ago. “No one even brings up the streak, how many games we’re winning or anyting like that,’’ says Taylor. “I mean, we know we’re winning, but no one keeps track of how many wins or how many games we’re up, or anything like that. This is a unified, and cohesive clubhouse last seen in these parts since the days of Kirk Gibson and Orel Hershiser when they last won the World Series in 1988. As much as Friedman, Zaidi and their staff have brought analytics and sabermetrics to this storied organization, they each believe their greatest accomplishment has been changing the clubhouse culture. “When I first got here,’’ Dodgers All-Star closer Jansen says, “there were a lot of islands in the clubhouse. A lot of islands. A lot of egos. A lot of me-type personalities. “We had the best talent in the league, but it never clicked. We couldn’t go any farther. There are no egos. Everyone understands that we need everyone to win. And no one takes anything for granted. If this were a couple of years ago, Jansen acknowledges, he would have walked out the door as a free agent. The Washington Nationals actually offered more money. The Miami Marlins made an attractive bid. Yet, when it was time to make a decision, he just couldn’t leave. “No disrespect to the people that were here before them,’’ Jansen says, “but these guys are so honest with me. Andrew and Farhan and Doc [Roberts], they’ve had my trust since Day 1. They told me how they were going to change the organization, made me believe it, and they proved it. “That’s why I couldn’t leave. The culture we have, the group of guys we have, it’s just so special. How could I leave this? It was no different than at the trade deadline when Friedman and Zaidi quietly vowed to several of the veterans that reinforcements would be coming. The players expected to acquire a left-handed reliever. The Dodgers instead grabbed two of them, Tony Watson of Pittsburgh and Tony Cingrani of the Cincinnati Reds. And, oh yeah, Texas Rangers ace Yu Darvish, too. “We already were a great team, but to do what they did, and have a guy like Yu in our rotation for the playoffs,’’ Hernandez says, “it makes such a huge difference. I mean, we weren’t going to go out and blow the front office up, and answer questions the way the Astros are doing now, but we are so happy. Friedman and Zaidi, deflecting any of the credit for the team’s success, will quickly point out that Roberts and Utley are the ones most responsible, at least, for the mood swing. Utley, told by Friedman just to be himself when he came aboard on Aug. 19, 2015, became the team leader. Roberts, hired after the 2015 season, drew everyone together with his overwhelming optimism and enthusiasm, earning the NL manager of the year award last season. There was never any scintilla of insecurity shown by Roberts with front office personnel infiltrating his clubhouse. He instead embraced the input, welcoming their involvement, whether it’s simply coming down and saying hello, or sitting down with players offering advice. You might say. After hitting just three home runs through his first 50 games of 2016, Turner hit 24 from June to the end of the season, prompting the Dodgers to re-sign him for four years and $64 million. He has a 1.009 OPS this season and earned his first All-Star bid. Such interactions are no different than the conversations Friedman and Zaidi have had with each member of the pitching staff. Every 40 games or so, they’ll sit down with the pitchers and break down their strengths and weaknesses, making sure they understand what’s working and isn’t. “I went through a tough stretch in Cincinnati and Cleveland,’’ reliever Ross Stripling said of a two-game stretch where he gave up seven earned runs while retiring just 11 batters, “and they kind of sat me down. Andrew wasn’t even looking at anything, but he was just spitting out stuff he knew about me. The execs are like a rotating band of big brothers: Wherever you turn in the Dodgers’ clubhouse, it could be Friedman and Zaidi one day, or Byrnes and Anthopoulos the next, or Colletti giving advice to players like Corey Seager and Bellinger who were drafted and developed under his watch. In ways the players can barely even begin to describe. 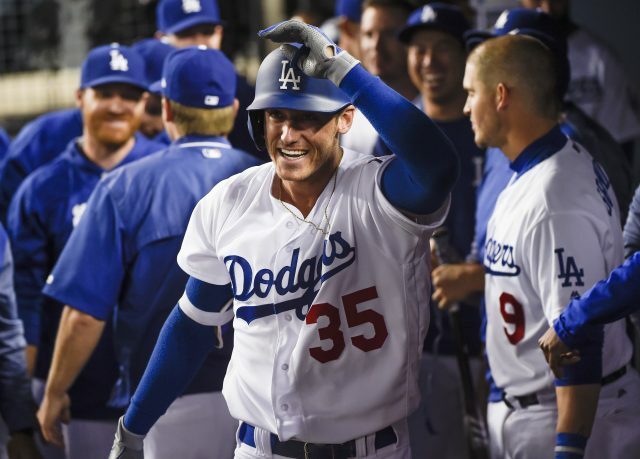 “Those guys are the backbone of our team with their information,’’ Grandal says. “Whenever we need some information, we just ask, and it’s there. I mean, if a guy’s right pinkie hurts, they somehow know, and tell us why they’re swinging a certain way and what pitch they can’t hit. “They encourage you to prove their system wrong, but every time I take something back to them, they show I’m wrong. I don’t even try anymore. “I know we’re the ones people talk about because of what we’re doing on the field, but what they do for us, come on, they’re the ones making us look so good. And perhaps leave a Game 1 ticket for Larry David, too.